Greg, George and Claudia are consummate professionals. Our very dingy and dark kitchen was transformed, at a fraction of the cost of a complete rebuild. The work was completed on time and at the price quoted. 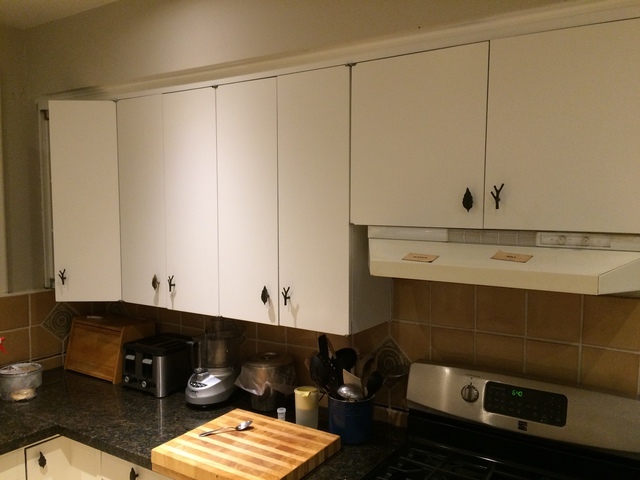 The crew worked a 12 hour day to finish - adjusting the cabinets for fit, and fixing an issue with a cabinet that was sagging. They were congenial and easy to work with - going beyond expectations. Highly recommended. We needed to replace curtains on 8 windows. We decided on blinds, and got a quote fom two suppliers. Kingsway’s quote was 40% lower than the other supplier. They came out to measure and produced the blinds in the time frame promised. The installer was professional and courteous. We are very pleased with the product and it’s appearance. We hired Woodchuck to install new hardwood floors. Their advice was to install a floating floor over the existing (badly worn) hardwood. This saved a lot of money, and the result was spectacular. Phil and Clinton made the installation easy. They left the area clean. I would certainly use them again. Thank you for your feedback, and enjoy your new floors! I called Prestige based on a Homestars rating. The grout in my shower enclosure was badly deteriorated. They showed up, gave a good quote, and completed the job on time and for the price quoted. The work was completed to my satisfaction. Thank you for the feedback.It was a pleasure dealing with you. We called Reliable based on Homestars rating. The technician arrived on time, and cleaned two very dirty couches. More than exceeded expectations. He was very professional and courteous. We will use them again. So glad we could exceed expectations. Nice to hear. Our pool had a slow leak which worsened over the winter. We contacted Larry at Pool Buoys (found on Homestars) who responded promptly, arrived when he said he would and detected and repaired our two small leaks on the same visit. The price we paid was exactly as quoted. He is a pleasure to deal with. I'm happy we could help. Enjoy the pool and let us know if you have any questions. I've used them twice - they arrive on time, finish promptly, and clean up. This time they removed some large branches from my roof that I could not reach. Excellent prices. Very professional. I selected this company based on Homestars reviews, and was very pleased. The selection of granite was extensive, and the person helping us was very knowledgeable about the materials. And the price was lower than any of the other places we visited. The installation went smoothly, and the installers were very careful about cleaning up. The plumber who installed our sink was very courteous, and stayed late to make sure everything was working well. A very happy outcme. I needed a replacement for a leaking outdoor faucet and an indoor shut off. Waterworks showed uo on time gave me an accurate quote, and completed the work very well. I was very pleased that they called twice when they were going to be a bit late. Very considerate. Hi Bill H in North York - We value your time as much as our own. In the plumbing business, delays can happen as sometimes what seems like a small job can reveal itself as a bigger problem. When we encounter such a situation, we always keep in touch with the following customers on our schedules so that they can budget their time accordingly. We appreciate you and your business. Thank you from the Team @ Water Works Plumbing and Drains Inc.
A highly professional company - showed up on time, gave a good quote, finished when they said they would. I have had two follow up visits for minor issues and they have proven very reliable - even phoning when they were delayed. One of the best renovation experiences I've ever had. Total professionals who took a great deal of pride in their work. Alex managed the job skilfully and the painters were careful, precise, and very pleasant. The job started exactly on time and finished a half-day early! We found Creative Painters through Homestars and hired them to paint our main floor. The job was complex with lots of paint colours requiring careful matching and edging. Alex provided a detailed quotation, and Vilco and Louis started and completed the job in the time promised. Their attitude was professional, and their work was beautifully done. I really cannot say enough good things about this company. I have been well served by all the companies I have found through Homestars, but these guys are something else. On the last day of the job, we had a celebratory lunch together in our newly painted kitchen with Louis and Vilko. The entire experience was amazing. We hired Rusco to demolish a worn out sun porch and install a new one. Israel explained the options, researched carefully, and gave us an excellent price. Gerry and Brian, the installers, were wonderful to work with - did a great job, left everything spotless. They were true craftsmen, great to watch work. They solved problems we didn't even know we had. I sent Drain Works an e-mail request on Sunday night - got a call back Monday morning - the new toilet was installed by Monday afternoon. This was not an emergency, but Jeff Wright (the installer) showed up on time (early, actually, but called to confirm that that was ok). He shopwed me options, and told me that my new toilet was eligible for a City of Toronto rebate. Great job, great service, and very pleasant to deal with. **Thanks Bill H.** We certainly appreciate your review and thank you for taking the time to share these kind works on the positive service you experienced with DrainWorks. We look forward to being your plumbing and drain service providers. I contacted three roofing companies, and Canadian roofing gave the best quote, and Bill Kishonti was the most personable of the roofers i talked with. The work was completed when he said it would be, and there were no surprises - just first class work, done by competent and plesant people. Bill also spotted some strut work that needed doing, and recommended another contractor who performed his work to the same high standard. And Bill called after each stage of the job to see if the work was performed to my satisfaction. A great experience - no wonder they have such high ratings. Cathal Boyd, the owner of Shamrock, came to us in October 2008 when our backyard was a mud hole - after a new swimming pool installation. He transformed it in three weeks to a beautiful garden and patio. He always did what he said he would do, and for the price he promised. When two cedars died over the winter, he took care of replacement. No fuss - no muss, and honest dealing. A pleasure to work with!